I rarely cross swords with Shankar Acharya, former chief economic adviser and one of the savviest observers of the Indian scene. But I must do so on the exchange rate. Contrary to what he and some other analysts claim, the rupee is not over-strong and is not hurting exports and manfacturing. Exports rose 26.7% in April-November, while imports rose only 24%. This would be impossible if the rupee was over-strong. 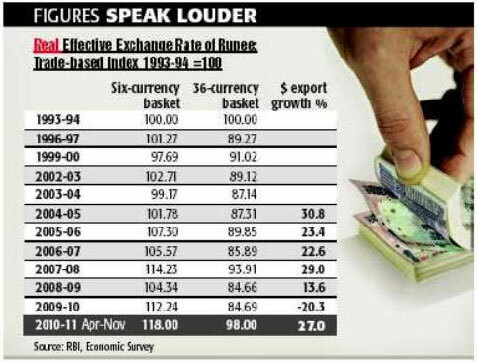 Since 1993, the Reserve Bank of India has intervened in forex markets to keep the real effective exchange rate (REER) of the rupee from appreciating. Acharya feels that this approach kept the economy on track, but now a strong rupee threatens derailment. The accompanying table lists fluctuations in the RBI’s two measures of REER, one based on a six-currency basket (all hard currencies) and the other on a wider 36-currency basket. After fluctuating around an index level of 100 for over a decade, the REER (six-currency basket) shot up to 112 in 2009-10 and further to 118 in April-November 2010. The other REER (36-currency basket) averaged 98 in April-November 2010, a slight depreciation since 1993. However, by this measure, the REER was not constant in the last two decades. It depreciated gradually from 100 in 1993 to 85.89 in 2006-07, then rose to 89.85 in 2007-08, sank again to 84.6 during the Great Recession, and has now appreciated sharply to 98. Which of the two measures is more relevant? Some will back the six-currency basket, since most trade is designated in these currencies. But India’s exports are typically very different from those exported by the big six economies. Rather, India’s main competitors are other developing countries, which figure in the 36-currency basket. Hence this is more relevant for our exports. It suggests the REER has not appreciated since the 1990s. It has indeed appreciated sharply in the last 18 months. But this is mainly a reversal of the rupee’s fall during the Great Recession. Today’s REER of around 98 is only modestly above the pre-recession level of 94 in 2007-08. Acharya wrote in September, “Goods exports, which had risen to 18% of GDP in the first half of 2008-09, helped by the global commodity boom, not only fell to 13% of GDP in the second half of the year as global trade plummeted post-Lehman, but pretty much remained there in the subsequent six quarters. Exports of $50.7 billion in the first quarter of 2010-11 were running 12% lower than two years ago. Scary? Yes, but looking at goods exports is misleading: India’s service exports have been rising so fast that they may soon overtake goods exports. What matters ultimately is the current account deficit, measuring the deficit in goods plus services. This widened sharply earlier this year, alarming Acharya and many others. But it shrank subsequently. In contrast to Goldman Sach’s earlier pessimism, Citibank’s latest estimate of the CAD this year and next year is just 3.1% of GDP, assuming an average oil price of $80/barrel this year and $90/barrel next year. The latest trade data is very encouraging. Yes, exports in some months were lower than they were two years ago, but the world at that time was on an insane overspending boom, which is no benchmark. The Great Recession meant that in 2009-10, exports fell 20.3%. Three months ago, Acharya described exports as sluggish. Not any more. Although the base effect is eroding fast, exports are booming and look certain to exceed the year’s target of $200 billion. In April-November, exports rose 26.7% while imports rose 24%. In November, exports rose 26.8% while imports rose only 11.2%. The monthly trade deficit fell to an eight-month low of $8.9 billion, much lower than the August deficit of $13 billion which alarmed Acharya. Commerce secretary Khullar says this is the first time in years that export growth has outpaced import growth. Indeed, the current export growth rate of 26.7% is faster than in the pre-recession year of 2006-07 (22.6%) when the rupee was 15% lower. The shrinking trade deficit suggests that the rupee is actually more competitively valued today, not over-strong. The best performance has come from engineering exports, up 50% in April-November. This surely demonstrates that a strong rupee has not crippled manufactured exports or production. Industrial growth data has been very volatile, and this may have misled Acharya and other critics. Manufacturing growth was just 4.6% in September, but shot up to 11.3% in October. Auto exports are up 48%, cotton yarn 46%, pharma 13.2% and chemicals 21%. No sign of an over-strong rupee here. Even if the current account deficit does decline to 3% of GDP, critics may argue that this is too high. I disagree. India has finally improved its ability to absorb capital inflows , and this is reflected in a higher CAD. This is a sign of health, not disease. We cannot be complacent. If the price of oil crosses $100/barrel, the balance of payments will feel the strain. Corporate governance concerns may reduce foreign portfolio flows to India. But this hardly justifies alarmism. The economy has sailed through much stormier seas. ← Lennon a Marxist or capitalist? We should not try to build up an economy dependant on exports. By exporting goods, we are not utilising the production base and labor for internal consumtion / for the benifit of Indians. We should export those goods where we enjoy inherent price advantage but not by slasing exchange rate. India has nearly 300 billion dollars reserves and Indians are importing 40 billion $ worth gold every year. These are huge reserves in case of remote requirement. Unlike earlier in developed countries, the growth of industrilisation has been marginal due to declining labor force and populations. If we appriciate the INR against other currencies, india can import state of the art technology cheaply to attain technological parity with devloped countries. Also inflation would be under control and the existing production base is also available for consumption by Indians. This also lead to political stalility, more long lasting employment and inflation free economy. We should not try to build up an economy dependant on exports. By exporting goods, we are not utilising the production base and labor for internal consumtion / for the benifit Indians. We should export those goods where we enjoy inherent price advantage but not by slasing exchange rate. India has nearly 300 billion dollars reserves and Indians are importing 40 billion $ worth gold every year. These are huge reserves in case of remote requirement. Unlike earlier in developed countries, the growth of industrilisation has been marginal due to declining labor force and populations. If we appriciate the INR against other currencies, india can import state of the technology cheaply to attain technological parity with devloped countries. Also inflation would be under control and the existing production base is also available for consumption by Indians. This also lead to political stalility and inflation free economy.